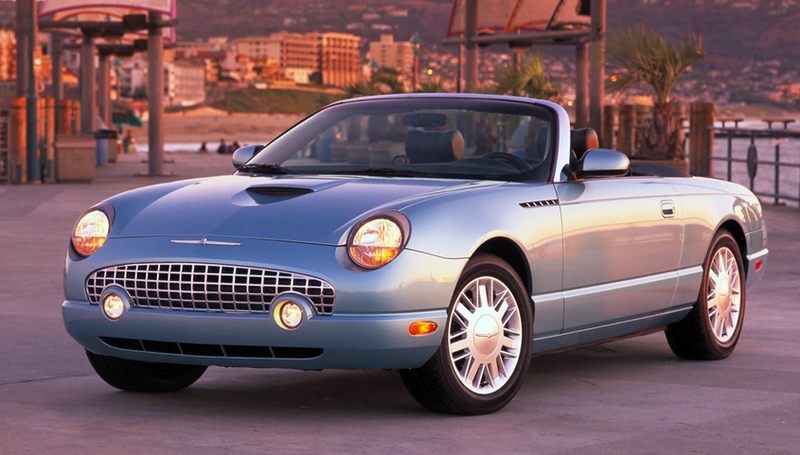 History has probably been unkind to the 11th-generation Ford Thunderbird. Ask your average enthusiast about the relative marketplace success of Ford’s retro-themed 2-seat convertible, and you’re likely to be told that the revived T-Bird was a flop. The numbers really don’t bear that assessment out, however. Introduced for the 2002 model year, the first Thunderbird in five years—and the first T-bird convertible since 1966—sold surprisingly well out of the chute, claiming a solid 31,368 paying customers. For comparison, the same-year Chevrolet Corvette racked up 35,767 sales. A more telling comparison might be Chevy’s similarly retro-themed SSR convertible pickup. 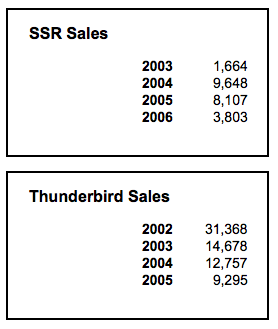 Similar in price to the Thunderbird, the SSR mustered only 9648 sales for 2004, its first full year on the market. Designed for relaxed cruising, the T-Bird was not offered with a sport suspension or an upgrade engine option. The standard powerplant was a 3.9-liter V8, which was a short-stroke version of the AJ-26 4.0-liter V8 available in the Jaguar. The T-Bird’s 3.9 was rated at 252 horsepower for 2002, and the addition of variable-valve timing for 2003 raised power output to a solid 280 hp. Despite strong first-year sales, and plenty of publicity—including a special-edition T-bird being the featured car in the 2002 Neiman-Marcus Christmas catalog—the momentum proved unsustainable. Seems the universe of people who can afford a $40,000 third car with only two seats is limited, and apparently everyone who wanted a ‘Bird purchased one early on. Sales for 2003 were down by more than 50 percent, and 2014 sales fell an additional 15 percent. All told, however, almost 70,000 11th-generation Thunderbirds were produced over the car’s four-year lifespan—nearly three times more sales than Chevrolet saw from the SSR (which also had a lifespan of four model years). The 2002-2005 T-Birds are holding their own as used cars, with clean examples of the more powerful post-2002 models going for more than $20,000. Bargain seekers take heart—there are plenty of high-mileage, rough-condition ‘Birds out there going for under $10,000. 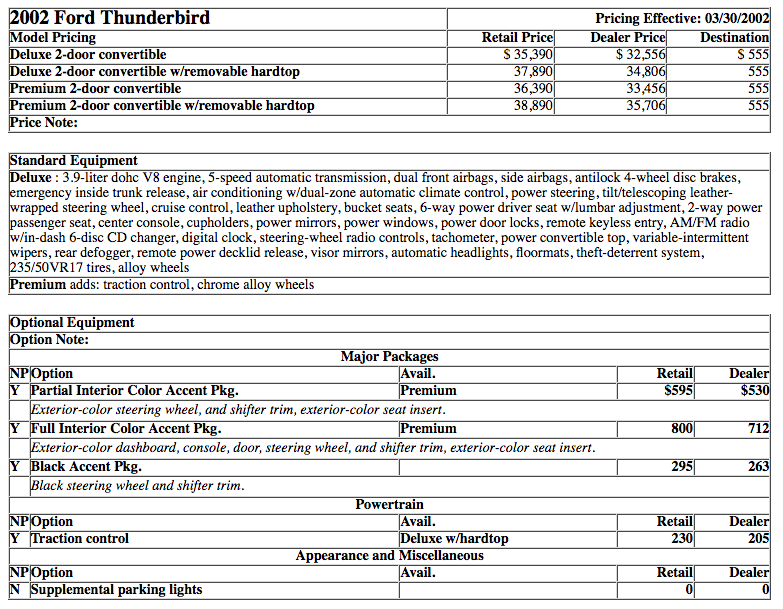 What follows is Consumer Guide’s original review of the 2002 Ford Thunderbird, complete with specs, prices, and options. 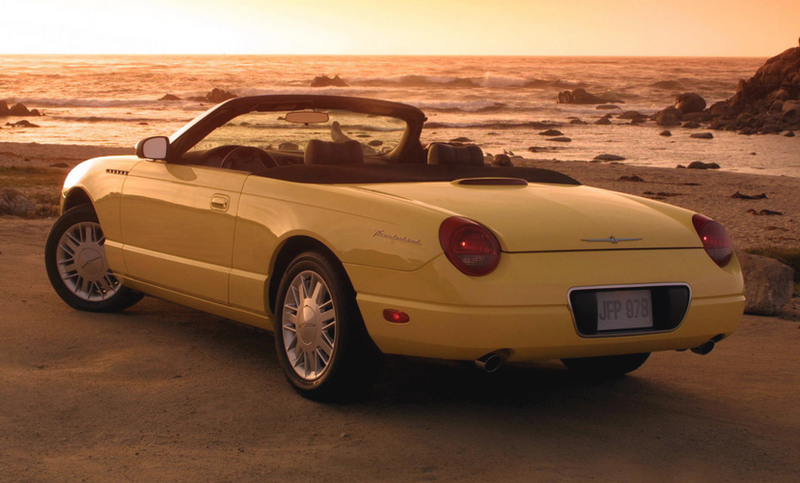 Ford restores a famous name to its lineup with the 2002 Thunderbird, a 2-seat convertible with retro styling cues. It’s built on a shortened version of the rear-wheel-drive platform developed for the Lincoln LS and Jaguar S-Type sedans. A removable hardtop with T-Bird’s trademark porthole windows is available to supplement the standard power-folding soft top with heated glass rear window. The only engine is the LS’s 252-hp 3.9-liter V8. Also shared is the Lincoln/Jaguar 5-speed automatic transmission. Standard features include antilock 4-wheel disc brakes, side airbags, 17-inch alloy wheels, and CD changer. A premium model adds chrome wheels and traction control. Interior upgrade packages match various trim pieces to the exterior color. Full-throttle standard-start power is good–7.0 sec 0-60 mph in our tests. Acceleration sufficiently strong once underway, and highway passing behavior more than satisfactory. But T-Bird is sometimes slow to respond in the 35-50-mph range because its transmission doesn’t always downshift promptly. Test examples averaged 17.4-18.6 mpg in about 60-percent highway driving overall. 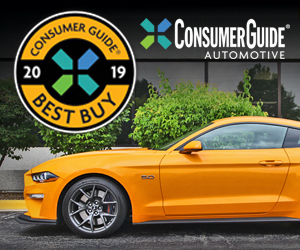 Ford recommends premium fuel. Not as smooth or solid as we would expect, but more compliant than most 2-seat convertibles, especially with top down, when bumps can be absorbed by body flex. More-than-moderate top-down cowl shake over bumps, but rigidity OK with hardtop in place. A relaxed cruiser. Too big and heavy to be sports-car agile, especially in tight maneuvers. But Thunderbird exhibits acceptable steering response, modest body lean, and good cornering grip. A cozy coupe with hardtop in place, and among the quieter convertibles with soft top up or down. Relatively minor wind disturbance top down, and normal conversation possible with windows up. Road noise, exhaust note are appropriately subdued, but engine emits a satisfying whine in full acceleration. Convertible top nicely lined and insulated. Basic dashboard design shared with LS, though T-Bird has unique black-on-white gauges with turquoise needles, which aren’t the easiest to read in daylight. Audio and climate controls close to driver, but look-alike climate buttons can be confusing. Convenient central latch on the windshield header manually releases the soft top, which powers down in about 8 sec. Overall, cabin falls short of truly upscale in appearance and feel, with run-of-the-mill materials and indifferent assembly. Optional body-colored trim looks jazzy, but some of it has a tacky, painted appearance. Wider than most 2-seaters, but the long-of-leg may find footwells confining. And with top up, tall folks will want more head room. Driver position nicely tailored via standard power tilt/telescopic steering wheel. But seats are fairly hard, and mostly flat. There’s no power backrest control, and heated seats are unavailable. Outward vision compromised by thick windshield pillars, and, top-up, by short side windows and top’s wide rear quarters. Hardtop’s porthole corner windows help some, but vision for lane changes still blocked by right headrest. Entry/exit better than in most 2-seaters, aided by conventional ride height and doors that are not inordinately long. Careful packing gets a couple’s small bags in shallow trunk, but it won’t accept tall objects. Bin behind seats suitable for purse, briefcase, or small gym bag, but nearly inaccessible with top up. There’s a small glovebox, console bin, map pockets, and two console cupholders, but no ashtray. Ford aims Thunderbird at “relaxed sportiness,” and pretty much hits the mark. It is not as mechanically refined as it should be, and interior materials feel relatively cheap. But Thunderbird is more practical than a genuine sports car, and as a near-luxury 2-passenger V8 convertible, it’s in a class by itself. Demand exceeds supply, so don’t expect discounts. Written by: Tom Appel on September 4, 2018.on March 21, 2019. What was the Dukes of Hazzard Car?